Veal breast riblets are long narrow cuts containing rib bones, a slight fat covering, and come connective tissue layered within lean. It is usually prepared by braising or cooking in liquid. Veal for stew consists of meaty pieces cut into one- to two-inch squares. They may be cut from the shoulder, shank, or round, and are usually prepared by braising or by cooking in liquid. Veal rib roast contains ribs six to twelve, rib eye muscle, feather-bones, and part of the chine bone. It does not contain tenderloin. It is usually prepared by roasting. Veal rib chops contain feather-bone, part of the chine bone, and, depending on the thickness, rib bone. The largest muscle is rib eye. Veal rib chops are usually prepared by braising or panfrying. Veal rib crown roast is cut from half of primal rib. It contains ribs six through twelve, which have rib bones trimmed one to two inches from the end. The ribs are curved and tied to resemble a crown when the roast rests on the backbone. Veal rib crown roast is usually prepared by roasting. Veal loin roast contains loin and tenderloin muscles, backbone, and a T-shaped finger-bone. It is usually prepared by roasting. Veal loin kidney chops contain backbone and featherbones. Muscles include the loin and tenderloin. The side includes the kidneys. The chops also contain cross-sectional cuts of kidney attached by kidney fat. Veal loin kidney chops are usually prepared by braising or panfrying. Veal leg round steak is cut from the centre of the leg. It contains top, bottom, eye muscles, and a cross-section of leg bones. It has a thin outer covering of fat and skin and is usually prepared by braising or panfrying. Veal cubes steaks, made from any boneless lean cut of leg, is identified by its square or rectangular appearance. The cube effect is made by a machine that tenderises the meat mechanically. 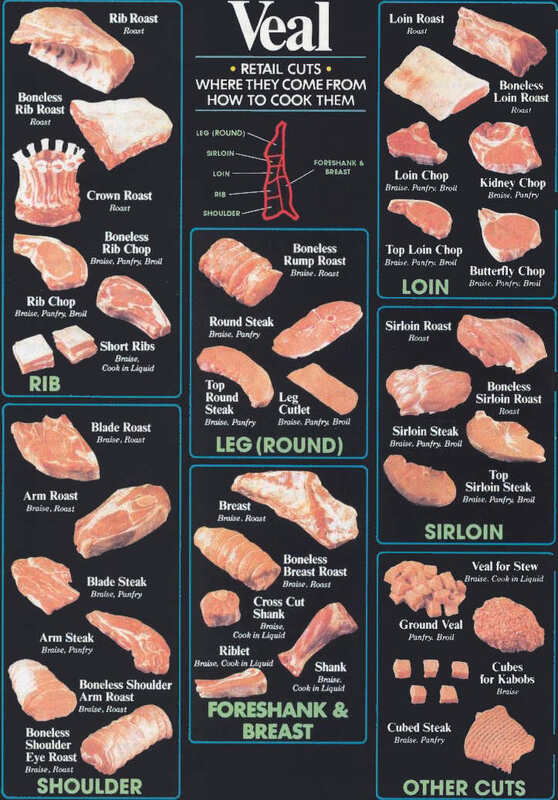 The steaks are made from several pieces of meat, though all cuts have the appearance of a single piece. Veal cube steaks are usually prepared by braising or panfrying. Veal cutlets are thin, boneless, very lean slices from the leg. They are usually prepared by braising or panfrying. Ground veal is lean meat and trimmings mechanically ground and sold in bulk or patty form. It is usually prepared by braising, panfrying, or roasting.